Remodel – Carlson Exteriors Inc.
Carlson Exteriors gets excited about Tremco’s product, Enviro Dri for many reasons. These range from monetary savings all the way to long term homeowner protection. Before we dive into the behind the scenes of Enviro Dri, many of you might be unfamiliar with it. I’d suggest clicking here and reading this page to get a quick understanding. The first benefit thats always on everyone’s mind is savings. How can something new save you money? While installation costs might be exactly the same as standard house wrap, using Enviro Dri during a new construction build can allow you to save money in other parts of your build. You can have thinner walls but have the same insulation rating because Enviro Dri is more energy efficient. The lumber savings alone is enough for many builders to switch to Enviro Dri from house wrap. House wrap can tear easily if left exposed to high winds. Enviro Dri is a liquid that applied to your sheathing; no part of Enviro Dri can be ripped or destroyed by high winds or any harsh elements. 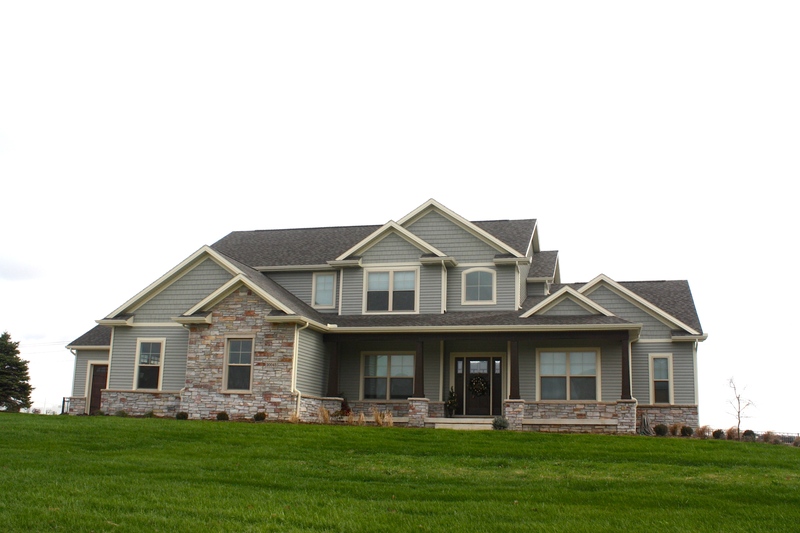 During the build of your new home, you can rest assured that your home is protected if it takes a little longer than expected to get your siding installed. If you aren’t building your home, knowing that you you have Enviro Dri protecting it gives you a little extra piece of mind if any piece of siding would blow off. 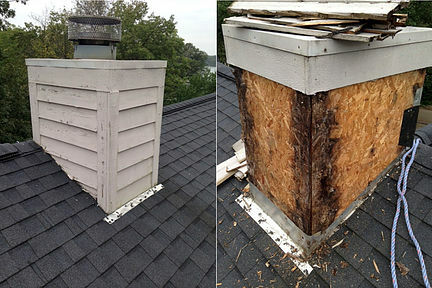 If you had a piece blow off or break, any exposed house wrap may also rip leaving the OSB exposed. Enviro Dri eliminates this from ever being a problem. EnviroDri is a water resistant membrane used as an energy efficient alternative to house wrap. Enviro Dri is a more hardy of a moisture barrier. It can also be used under all products (brick, stone, stucco, etc). It will stand up to surface active contaminants that are frequently found in wood, stone, fiber cement siding. Over time these contaminants can break down house wrap’s barrier. There are no mechanical fasteners used in Enviro Dri’s application. Since it’s a liquid that’s applied, there are no nails or staples keeping it attached. Normally these areas could leave you exposed to a water infiltration. With house wrap your home will have many seams that could fail. These taped seams could fail from not being taped correctly to not withstanding the settling of your home over time. There are NO seams in Enviro Dri. As an added measure, everywhere the OSB sheets join up, our installers add a mesh strip to flex with the OSB (if needed). Do you absolutely love working with your contractor? Or do you dread the thought of another run around where you spend too much effort trying to just get one phone call returned? Do you feel like you always get over charged on a service that wasn’t that professional? This might be obvious, but you want a contractor with a permanent location in the area that you live. Double check Google to see if they have an address listed, then drive by it to make sure it’s an actual office with office hours, and not the owner’s house. It never hurts to know that you can walk in and have a face – face conversation. After you’ve confirmed that they are a local contractor, research their reputation. Ask neighbors, friends, and co-workers. Google them, Google the owner’s name. Stalk the company! Find out everything you can about them and make sure you like what you find. The State of Illinois requires contractors to have a roofing license. A contractor can only pull a roofing permit if the city has the valid license and updated insurance. You might be saying “Duh – tell me something I don’t know!” Well did you think about looking at the roofing license to make sure it’s your contractor’s license and not their friend’s? Sometimes contractors share a license and an unlicensed roofer will essentially “subcontract” under a licensed roofer. Your estimate and contract might be from Contractor A, your check will even be made out to Contractor A, but if you look at the City’s permit records your roofing permit will be registered to Contractor B. That’s because Contractor A, your contractor is not licensed. Another sign that they aren’t licensed is if your roofer asks you, the homeowner, to pull your own roofing permit! Never put up with that! Homeowners are allowed to pull their own permits without a license; but if a contractor is doing the work they should be responsible for the permit and the permit fees. Besides, it’s rude if they want you to pull their permit – even if they are licensed! This Normal IL has green siding and shutters, white vertical siding and trim. Everyone always verifies that their contractor is insured; but there is an extra step a contractor can do to prove their love for you. Add you as an additional insured! Contractors don’t like doing this because it does cost a little extra to have you listed, but any trustworthy contractor knows you are worth it. If your contractor doesn’t already provide these up front, you should ask for a letter from their bank and a letter from their supplier. The bank letter lets you know that the company isn’t broke and does not run finances through the owner’s personal bank account. The letter from the supplier lets you know that your contractor pays the material bills. Last thing you want is a lien placed on your home because the contractor didn’t pay for his materials. All contractors should give you a written estimate filled with all the details of the work to be performed. It should be extremely detailed and include a total price. On top of the professional estimate, the contractor should no pressure you in any way. Pressure can on many forms. Scare tactics, calling more than they should, telling you the price expires in a week, and any other gimmick. Once this final contract is signed by both you and the contractor that should be the final price. As a homeowner you should expect your contractor to honor this contract. It’s their promise to you. Most contractors have a labor warranty to accompany their work. Typically this is 1 year. Some contractors might extend that warranty for longer, but be weary of anything less than 1 year. You should ask for material warranties of the products being placed on your home. 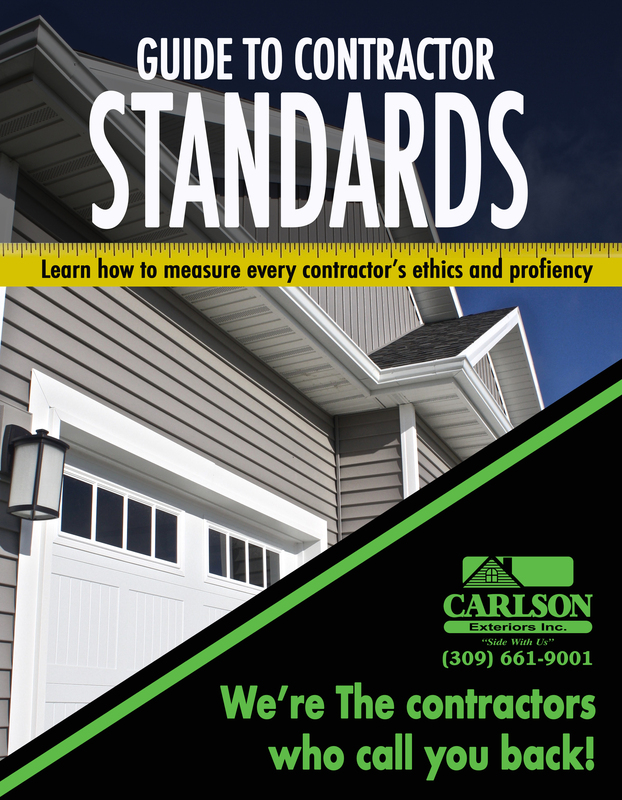 Manufacturers can vary warranties based on contractors and what they are certified to guarantee. Carlson Exteriors offers a 50 year non prorated warranty. This warranty will be registered to homeowner’s name and can be transferred one time! If you sell your house after we’ve replaced the roof your warranty goes with it. Look for any extra love and assurance that a contractor can provide you in the material warranty department. Click here to learn more about our Unconditional Roofs.